Desert of Pharan is an ongoing project that documents the rapid development of Islam’s holiest city. The title is taken from the ancient name for Makkah (Mecca), or the wilderness and mountains surrounding it, which is Faran or Pharan, referring to the Desert of Paran mentioned in the Old Testament. The second chapter of this project is currently presented at the Sharjah Biennial 11. Desert of Pharan / Room with a View focuses on the tension between public and private space in Islamic cities. While Makkah is home to more than a million residents, it is being transformed to cater to the needs of millions more pilgrims and tourists. Existing models of urban development have been implemented on a vast scale. Equipped with imported financial and development know-how, Makkah is attempting a transformation in order to adapt to the geopolitical, technological, environmental, geomorphological and religious context in which it exists. In the city of Makkah, a new future is being drawn up. Its contours are becoming visible amidst a landscape teeming with initiatives - from the most public to the most private - aimed at developing and reinventing seemingly fixed rituals, states and assumptions; culminating, perhaps, in the re-imagining of life at the center of the Islamic world. Makkah is a source. 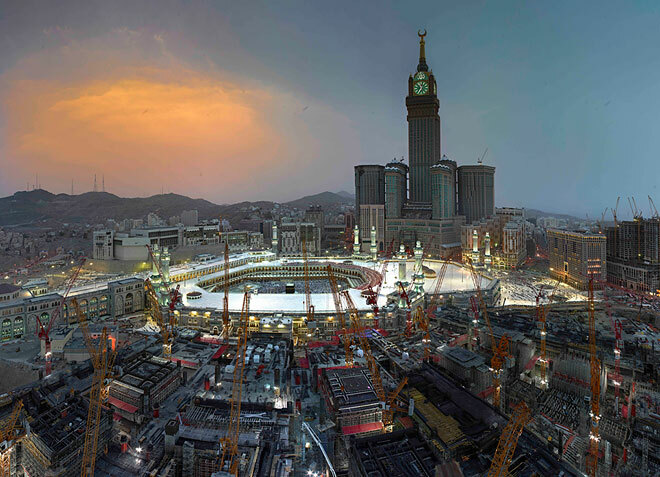 Makkah is shaped by its own narrative which can be traced back to the time of Abraham, and at the same time it releases increasingly significant effects as the global Muslim population grows and becomes more connected. Amid a rapidly changing economic landscape, Makkah is re-examining its situation with regard both to itself and the world beyond. In Saudi Arabia today, contemporary models of urban development based on imported developmental know-how have become the starting point for a host of proposed new cities. For the most part, each will be constructed on a social and historical tabula rasa. Makkah presents an alternative dialogue between plan and reality. Like few other 21st century cities, it is rooted in a complex and highly emotive context in terms of its historical, geopolitical and religious symbolism. It is both one of the most visited places on earth and one of the most exclusive, and yet it is in flux, it moves, grows and invents itself again. In between the mega-developments the public space is squeezed, and the surroundings of Islam’s most important mosque privatized. As public space disappears under pressure of real estate speculation, security measures and collective neglect, the price of private access to it increases: a view of the Haram al Sharif, the public courtyard surrounding the Kaaba, can push the price of a hotel room to 3,000 USD a night. This work asks: Is public space in the Islamic city becoming a luxury item? Is the courtyard becoming a commercial fiction? 13 March - 13 May 2013, United Arab Emirates. Curator: Yuko Hasegawa. Sharjah Art Foundation President and Director: Hoor Al Qasimi.